After a very chilly night in Swan Hill it was on the road again for Buronga which us a small town of approx 1200 people on the New South Wales side of the Murray River. It's sister city on the Victoria side is much bigger, in fact it is a city with a population of about 60,000. On the journey we stopped of at a couple of small towns to stretch our legs, eat and have a look. The first stop was in a tiny little village of Nyah West with a population of around 600, although it actually looks like there would a lot less people living there. 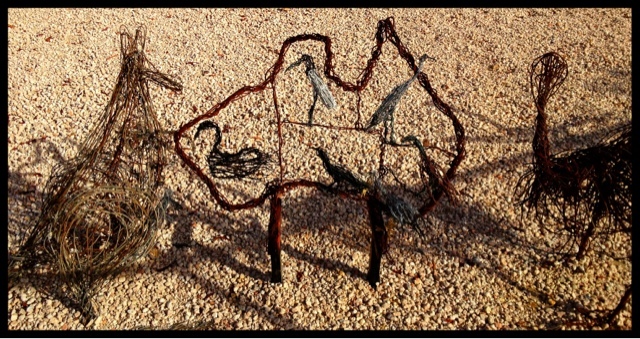 One talented artists work caught my eye with some very interesting art pieces out of wire. Our next stop was in the township of Robinvale. I had read that this town was very multicultural and sitting down having lunch (and a very nice lunch I must say) I had to agree. As well as Australians there were a lot of Pacific Islanders and Asians - I think from Vietnam. At first I was a bit bewildered why so many different nationalities would head to Robinvale. But my assumption was that a lot would be there for the fruit picking. I know a little about fruit picking as my son Shane did it for quite a few summers. It was hard work but he earned a lot of $$$'s. I read some interesting stats on the fruit etc. grown in his area. Almost 100% of Australia's dried vine fruit eg. sultanas, currants etc. 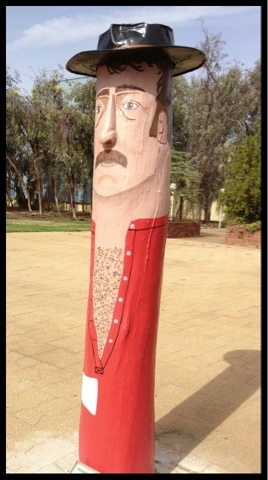 On the foreshore in Robinvale there are the last two of the bollards that have been made in appreciation of numerous river people of the past. They are located in various places between Swan Hill and Robinvale. Woodcutter - in the paddle streamer heyday, over 200 boats travelled on the Murray. Each burnt more than half a ton of dry redgum per hour. Woodcutters lived beside the river, carting their own woodpiles with horse and wagon. Boat Captains left a note saying how much wood they had taken, paid later. Captain John Egge: Came originally from China and started working on riverboats in 1854, a year after the first boats travelled on the Murray. 12 years later he had his own boat, and by 1870 was one of the biggest boat owners on the Murray-Darling. He owned several boats and barges, and many businesses on shore. Great Day 2 Adventures, Davine. I am enJOYing learning about the history of the region ... very interesting about the fruit stats! Also can't really imagine how much wood must have been used back in the heyday of the Murray Paddlesteamers! 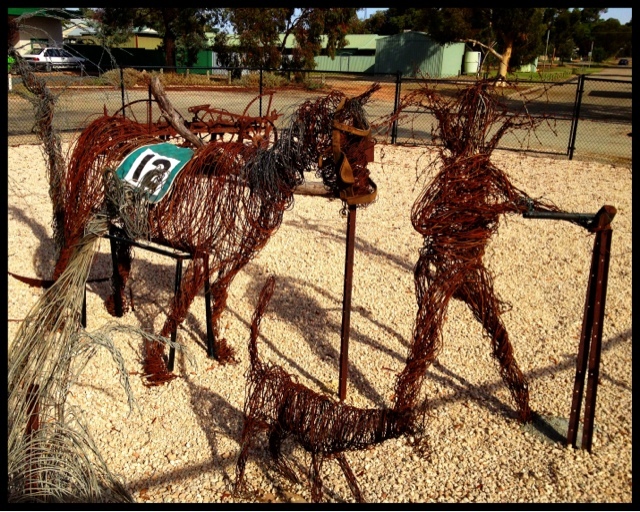 I really like those wire sculptures!! They'd look great in a garden, don't you think? And those wooden characters....very well done and catching one's attention for sure. Such a diverse culture you have there. Just day two and I'm loving your adventure.. Thanks for taking me along!